(a) Using a knife, cut off the lip of the rear engine oil seal. (b) Using a screwdriver, pry out the rear engine oil seal. 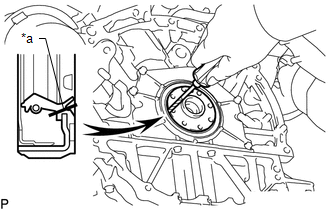 Do not damage the surface of the rear engine oil seal press fit hole or crankshaft.